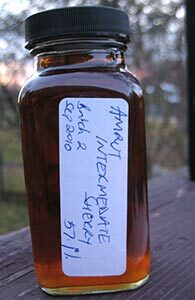 It’s been almost three year since my last review of an Amrut. The distillery’s strong reputation among single malt whisky drinkers endures, even if they’re not quite as exciting a prospect as they were a few years ago. Their lineup hasn’t changed very much either, and in the US we mostly see the Fusion and the regular and cask strength editions of their standard and peated releases. As far as I know, we have still not begun to get the single casks that go to the UK and EU and even to Canada. 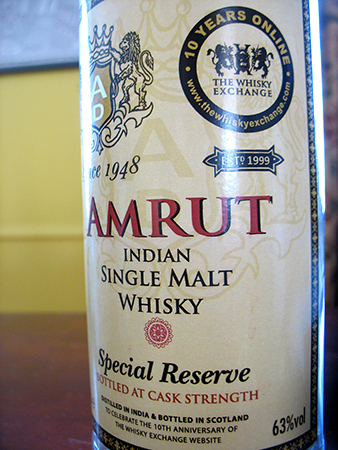 If true, I’m not sure why that is—is the market for Amrut in the US not strong enough to sustain that? I’d imagine that those paying >$100 for the Intermediate Sherry and Portonova releases would be fine shelling out for the occasional single cask as well. 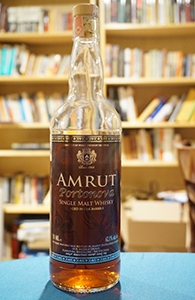 In my review of Amrut’s Portonova on Wednesday I mentioned that I’d opened it for an Amrut tasting that also featured three single casks of different kinds. This was the one we started with. Whisky made from unpeated barley, matured for just over 4 years in a single bourbon cask—this was a EU release. I’m not sure why we don’t get these single cask Amruts in the US (unless, of course, we do and I’m just misinformed as usual). I saw one on sale in Montreal when I was there in March. Is this yet more evidence of the relatively immature market for single malt whisky in the US? Or are we poised to get some too soon? As per the label this cask lost a staggering 42% of its volume during that brief maturation. 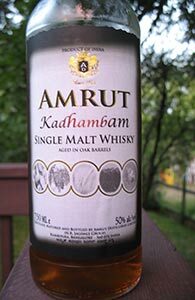 I think we have to forgive Amrut the fact that they charge higher amounts than we would in the abstract like to see asked for young whisky. Anyway, let’s get right to it. 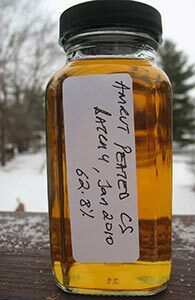 Following my review of the Amrut CS, Batch 2, here is the Amrut Peated CS, Batch 4, which was also released in January 2010. It is an even higher octane whisky, coming in at a whopping 62.8% abv. I believe Indian barley is used in the regular Amruts (46% and CS) whereas peated Scottish barley is used in peated Amruts. I could well be wrong though so please do not take this as gospel. And if you know for sure one way or the other please chime in below. Amrut is now so identified with all their one-off or otherwise limited edition whiskies that their core line-up seems to get lost in the shuffle. Well, maybe that’s not true of the Fusion, but the basic 46% releases and even the rather good cask strength releases certainly don’t seem to get talked about much these days. That’s a shame as the cask strength versions, at least, are rather good. 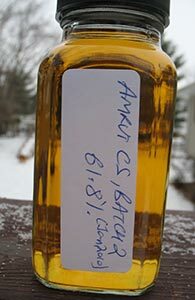 I’m as guilty as anyone else as all my Amrut reviews so far have been of the more exotic/hard to get bottles. While I don’t have any of the 46% bottles at hand I do have large reference samples left from my bottles of the regular and peated CS releases from a couple of years ago. This review is of Batch 2 of the regular CS (unpeated) and will be followed soon by a review of Batch 4 of the peated CS. This was bottled in January 2010–I have no idea what batch number they’re up to now. This is another of Amrut’s gimmicks, I mean experiments. Some of their normal peated whisky, which is matured in bourbon barrels was matured for an additional year in custom made 100 litre virgin oak casks. It was then bottled at British 100 proof (57.1%) and 100 bottles (at 100 cl rather than the usual 70 or 75 cl) each were originally released in five different countries. 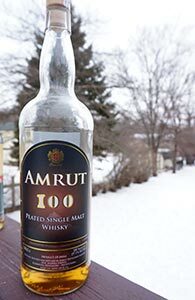 As the US was not on that list I am not sure if we are only the sixth market to receive the Amrut 100 or if this batch was bottled for a whole new list of countries. At any rate this is bottle 38 of 100 for the US. 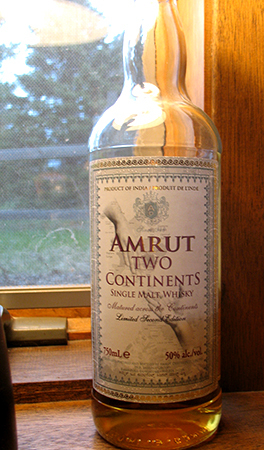 Amrut Two Continents, 2nd Ed.